Duns is a step closer to getting a new primary school after Scottish Borders Council authorised the start of construction within the coming weeks. 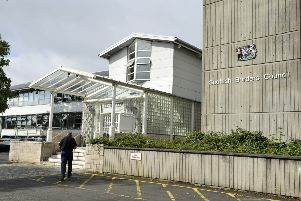 The council has been working alongside its development partner Hub South East Scotland, who have appointed Graham Construction as the contractor, to progress the £8.6million project, which includes relocating the primary school and creating a new Berwickshire Locality Support Centre within the former Berwickshire High School building. The project is part funded by Scottish Futures Trust (SFT), and SBC’s executive member for education, Councillor Sandy Aitchison, said: “I am delighted we have reached this significant milestone. SBC’s executive member for social work, Mid Berwickshire Councillor Frances Renton, added: “Incorporating a new Berwickshire Locality Support Centre into this project will benefit children with additional needs. Paul McGirk of Hub South East Scotland added: “It’s exciting to reach this major milestone and know that work will soon be able to start on construction, making these plans for Duns Primary a reality. David MacDonald, Hub programme director at SFT, explained: “The hub programme is an innovative approach to develop and deliver best-value community facilities which provides public bodies with a quick and efficient way of getting their projects into construction and helps protect local jobs. The former high school building has been empty since 2009 and the council acknowledged that “the building has suffered from significant fabric degradation since its closure”.